Precious alpaca fur, hand-worked and hand-sewn, in a very modern design. We can manufacture this carpet in any size you require for a special place where you want to give a nice and exclusive look! The carpets can be simply cleaned with the vacuum cleaner. To take away any dirt or spots, take a normal carpet cleaner, brush it and let it dry flat in the floor. 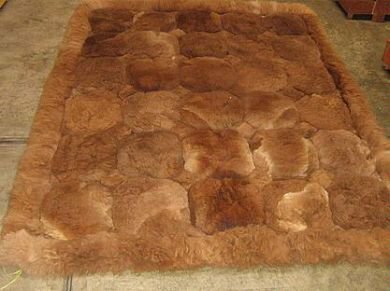 From time to time let your fur rug in a place where the sun shines over and the hairs will look much nicer and puffy. In the event you will want to wash it completely, it must be in a dry clean way and to a special place for skin or leather dry cleaners. NIB Tahari Home 100% Cashmere Heather Brown Diamond Pattern Throw Blanket - 50" x 60"